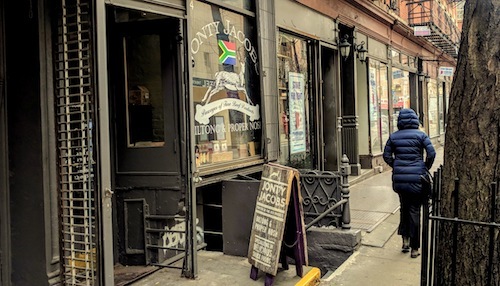 Over three years ago, a small shop popped up on Christopher Street in the West Village with the bright, multi-color flag of South Africa. 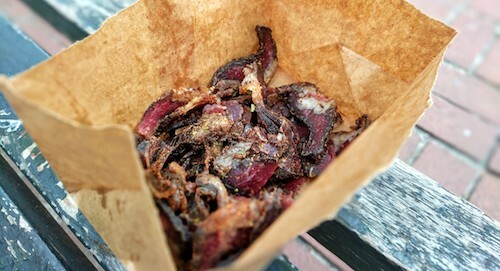 While they have scaled back their operation somewhat, Jonty Jacobs is still the place to go in New York City for the nation's very distinct style of biltong, a dried and cured meat that puts commercial North American beef jerky to shame. Named partially after the owner's favorite butcher as a child and presumably rhyming with "jaunty," it somehow is a good description for the fun shop that also sells packaged and canned goods from South Africa for homesick expats. 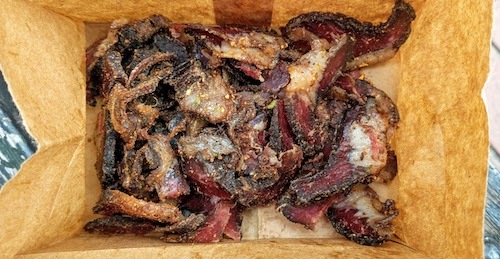 The biltong ($40/lb, above and below) is sold in four different forms, both fatty and lean pieces can be both wet or dry. A 1/4 pound $10 bag like the one shown is just about the right size for a hefty snack. Unless you have a machine at home to do the slicing, have it cut up in the shop with theirs. If you want to "give it a little kick," accept the offer a sprinkle of peri-peri powder. The beef cannot be eaten extremely fast, as it all has a good chew to it. The first note you will experience is vinegar, which is the main ingredient of the marinade. This is an extremely appealing complement to the natural beefiness. Apparently the facility they make everything is down south, and they get fresh shipments weekly. The beef is all domestic, but the style is all South African, you won't find anything like it. 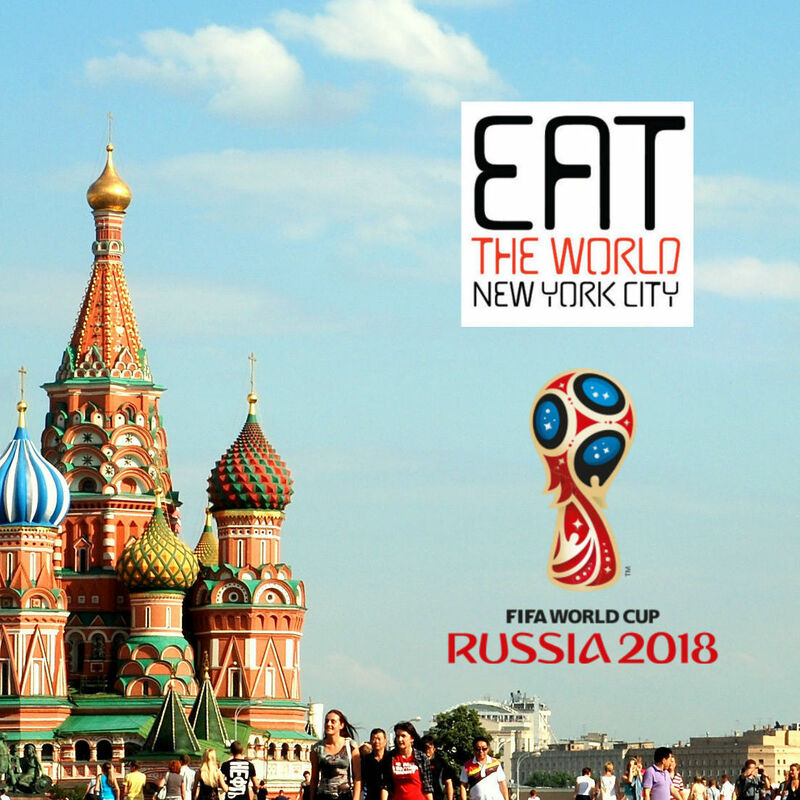 They stopped selling fresh meat pies and pastries, but you can still find some of these frozen if you are in the mood to bring some more treats home.